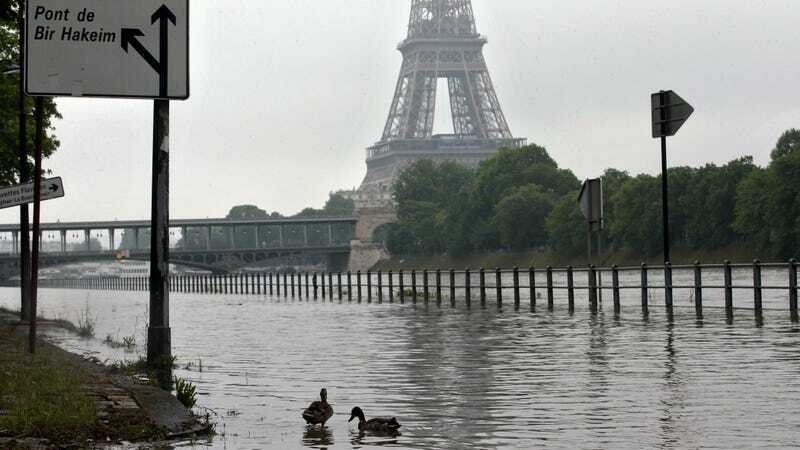 Over the last few days heavy flooding across France, Austria, and Germany has resulted in some scary photos, including surreal images of the Seine spilling over its banks in Paris. The river is getting a little too close for comfort for the Louvre, which is relocating some of its art. The Louvre and the Musée d’Orsay will both be closed tomorrow as the institutions take emergency precautions to ensure their works are protected. Interestingly, the museums have prepared for exactly this type of disaster as part of a “flood of the century” exercise conducted earlier this year. The Louvre will have to move about 250,000 works to higher ground. Don’t worry, that’s a video from the simulation. The last major flood to hit the city was in 1910, but the water is not that high—yet. The 1910 flood, dubbed a 100-year-flood, saw waters that crested at 27 feet. The Seine is currently about 16 feet higher than normal and the river is expected to crest tomorrow. Still, it’s really weird to see Paris like this. French President Francois Hollande declared a state of natural emergency and said he hoped the country was encouraged to take action against climate change. Over on this side of the globe, the rain in Texas has been just as relentless, with flooding that’s the worst in its history. Today, the governor declared a state of disaster in 31 counties. And right now, about half the state is under an active flash flood watch. That’s an area larger than the entire state of California.